It’s never been easier to find Chevy trucks for sale in Wisconsin. Come to Ewald Chevrolet Buick near Waukesha WI car dealerships. Ewald Chevrolet Buick has used Chevy trucks for sale to the latest Chevy models to choose from at our dealership near Waukesha WI. Come to your local Chevy dealership in Wisconsin and check out one of the many used Chevy trucks for sale. Here at Ewald Chevrolet Buick, we have many new and used trucks to choose from including many used Chevy trucks in Wisconsin. There is no need to search other Waukesha WI car dealerships when we have the trucks you want at a price you can afford at Ewald Chevrolet Buick. So, when you are trying to find used Chevy trucks in Wisconsin at Waukesha dealerships, Ewald Chevrolet Buick is when you need to go. Here at your local Waukesha dealerships at Ewald Chevrolet Buick, we understand that the process of finding a used Chevy truck for sale near you that fits your wants and needs can seem never-ending. Especially when you are looking for a truck that can handle difficult tasks. That is why we have a team of used Chevy truck experts. They are happy to answer any and all questions you may have about the many used Ford Chevy for sale near you in Waukesha WI. That includes questions about the many used Chevy trucks in Wisconsin at Ewald near Waukesha WI car dealerships. With over twenty used Chevy trucks for sale near you, we are confident that you will find the perfect Chevy truck for your needs. 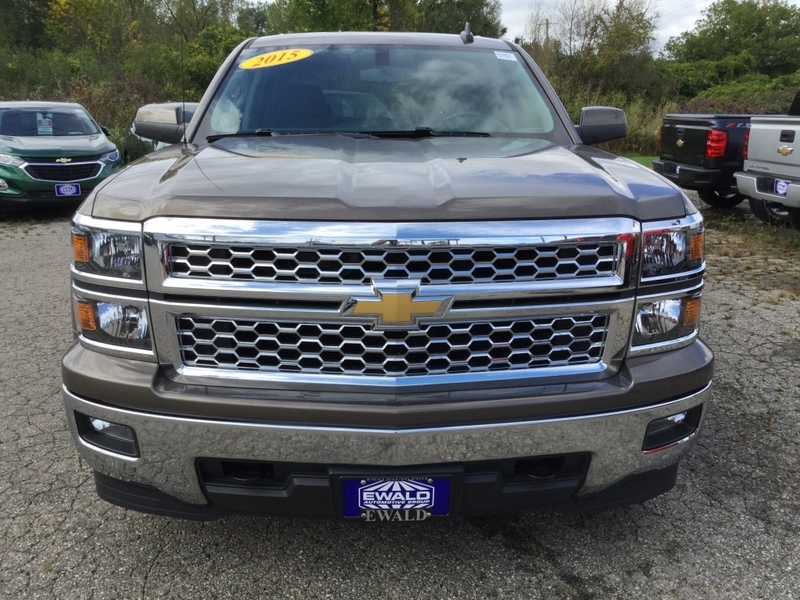 Get ready to take on the streets of Wisconsin in the used 2015 Chevrolet Silverado 1500 LT for sale. This used Chevy truck for sale near you is full of incredible features. Such as Chevy MyLink, remote start, and more. Chevy MyLink includes an 8" Diagonal Color Touch With AM/FM/SiriusXM. As well as USB Ports, an auxiliary jack, SD Card Slot, and much more. Like Bluetooth Streaming Audio For Music And Most Phones. Hands-free Smartphone Integration, Pandora Internet Radio, Voice-activated Technology For Radio And Phone are also a part of this incredible amenity on this used Chevy truck for sale. Be sure to see this used Chevy truck for sale and take it for a test drive. When you find yourself looking for Waukesha dealerships with a variety of used Chevy trucks for sale in Wisconsin come and see us. Ewald Chevrolet Buick strives to make your buying experience a pleasurable stress-free experience. We make it a point to provide a great selection of used Chevy trucks in Wisconsin. As well as transparent dealing, and fast and friendly credit processing. Find Ewald Chevrolet Buick located at 36833 E Wisconsin Ave, Oconomowoc WI 53066. Or give us a call at Ewald by dialing (262) 226-2842 to schedule a test drive today.